API clients and settings can be managed through the Console or APIs. See below for step-by-step instructions for each option available in the Console and the corresponding APIs that can be used instead. Additional endpoints for managing clients and settings are also available in the API documentation. From the Manage Properties page, click Create Property. In the Name field, enter a name for the new property. Note that property names must be unique; for example, you cannot create a property named North America if a property by that name already exists. The Console will not overwrite an existing property. In the Permissions pane, select the features for the property (features are used to manage access to user profiles and application management capabilities). By default, the login_client feature is selected for you; this feature is used for API clients that handle user logins and registrations. To select a different feature (or set of features) clear the login_client checkbox and then choose the appropriate features. If desired, click Add New IP Address and configure an IP whitelist for the client (IP whitelists specify the IP addresses of the computers allowed to make API calls using the property). Click the Create Property icon to save the new property. Note. For more detailed information, and to watch a short video that describes how to carry out this procedure, see the article Creating a Property. Refer to the /clients endpoint for information on how to create new clients via API. From the Manage Properties page, click the property you want to rename. The property will be renamed. Note, however, that only the name changes: the client ID remains as-is. The property will be deleted. 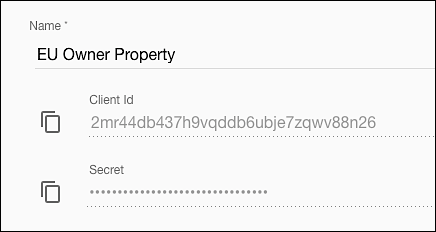 From the Manage Properties page, click the property whose client secret needs to be reset. On the Edit page, click Reset Secret. In the How long would you like the current secret to remain active? dialog box, in the Hours to Expire field, enter an integer value between 0 and 168, inclusive. In the Are you sure you want to reset this secret? dialog box, click Yes. In the Secret successfully reset dialog box, click Close. Note. For more detailed information about resetting client secrets, and to view a short video on carrying out the procedure, see the article Resetting Client Secrets. You can also use the /secret endpoint to perform this action. If you need to reset the owner API client secret, please open a support ticket notifying Akamai of this update. 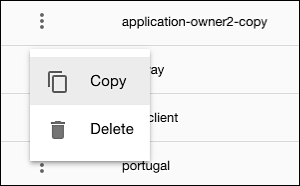 In Manage Properties, click the Add Setting icon. To add a standard setting, in the Edit Settings pane, click Select setting key and then click the setting you want to add. In the Value field, enter the value for the new setting. To add a custom setting, type the setting name in the Select setting key field. Note that setting names cannot contain blank spaces; individual words in a name are typically separated by using underscores (my_setting_name). As you type, the setting name appears in the Create setting button located just above the new setting. Click (in this example) Create site_locale. Type the value for the custom setting in the Value field. When you are finished adding new settings, click the Save Changes icon. Note. For more detailed information, and to watch a short video that describes how to carry out this procedure, see the article Adding a Property Setting. Please refer to the client and settings endpoints for information on how to create and update settings via API. When creating a new setting key, the API will return false as a successful response, indicating that the key did not already exist. To update the value for an existing API client setting through the Console, please see the article Modifying Property Settings. Note that you cannot edit the key name for an existing setting. To update the key name, you must first delete the setting and add it again with the full key/value pair. See the section below for details on deleting settings. Please refer to the client and settings endpoints for information on how to create and update settings via API. When updating an existing setting key, the API will return true as a successful response, indicating that the key already existed. Please refer to the client and settings endpoints for information on how to delete settings via API.